If you’ve got zero will power (like us!) then I suggest you look away now. Click away from this page. Go and Google images of celery or something healthy instead. Just, whatever you do, don’t go on reading about the most amazingly chocolaty, gooey, moist, cake, adorned with ball after ball of Malteser goodness. Too late? Oops. Ok, take a look at this and if you can then override the jungle drum call of a packet of Maltesers you are superhuman and we take our hats off to you. We’re already weighing out the cocoa powder (but may have to go and buy more Maltesers as they seem to have, um, disappeared!). This recipe was taken from the December edition of Olive magazine. We ate almost a whole one of these cakes at a little gathering the FCFK Hackney committee had. We feel we are well placed therefore to say that it is gooorrrgeous. Forget the Christmas pudding – go and make yourself one of these instead! Line the bottom and sides of a 23cm (at least 10cm deep) cake tin with baking paper. Heat oven to 180c/160fan/gas 4. Beat egg whites and cream of tartar until stiff. Put the remaining cake ingredients into a separate bowl with 190ml of water and blend to a rich thick chocolate mix. Fold in the egg whites – do not beat. When the mixture has no more white streaks pour into tin. Bake for approx 1 hour. When it is ready it will feel spongy with a soft crust on top. Cool in tin for 10mins then remove and peel off paper. Put the cake on a cake board. Put the buttercream ingredients in a large bowl and beat until soft and creamy. Ice cake in an even later starting at the bottom of the cake until all is covered. 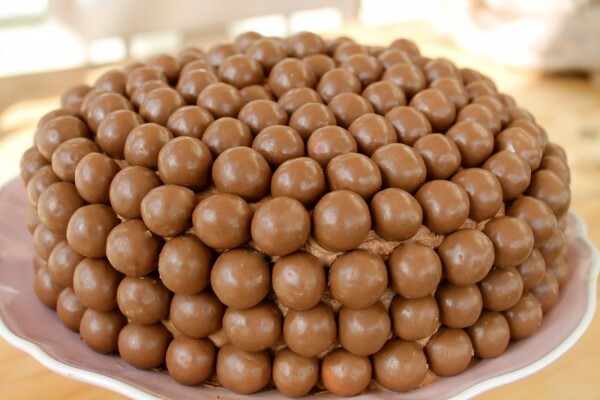 Starting at the bottom again push the maltesers one by one into the icing – work your way up in circles until you have reached the middle of the cake. I love cakes that make me weak!